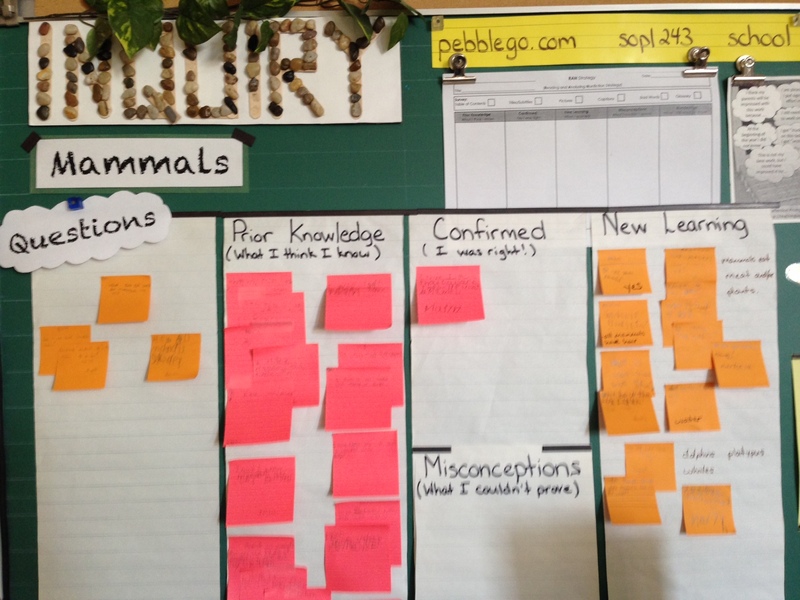 On Friday last week we learned a lot about mammals by video conferencing with the North Carolina Zoo. Before our video conference we had a lot of questions. 10. If an animal eats meat and plants they are called omnivore. 12. We got to meet an opossum. Opossum are nocturnal. That means that are awake at night. They are omnivores. They eat meat and plants. We also learned that they are marsupials. That means that carry their babies in a pouch like a kangaroo. 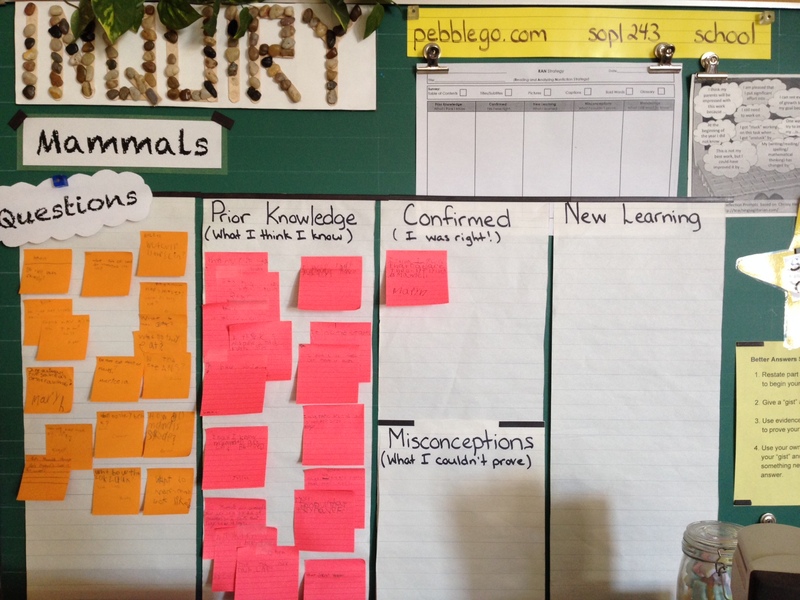 After our video conference we revisited our questions and moved some of our notes from the Questions chart to the New Learning chart. Tomorrow we will confirm whether What We Think We Know was Confirmed or a Misconception (something we couldn’t prove). There are some questions we still have about mammals. Can you help us answer them? 1. If an animal eats meat and plants, does it have sharp teeth and flat teeth? 2. What is a platypus? Is there a link to a video or information online that you could share with us? 3. Do all mammals have tails? 4. How do mammals sleep? 5. What part of the land do mammals live in? Thank you again Steve and the North Carolina Zoo for helping us learn about mammals. We loved meeting the opossum! Thanks a lot for Skyping with us last week about mammals, and thanks for the other questions you’ve sent us. Steve is traveling right now and will not be back in North Carolina until 6 April, so I’m going to answer your questions. Question 1. If an animal eats meat and plants, does it have sharp teeth and flat teeth? You probably already know that animals that eat both meat and plants are called omnivores. Because they eat so many different kinds of food, they usually have different kinds of teeth—and each type of tooth is specially evolved for a particular kind of food. Think about your own teeth. As an omnivore, humans have really sharp canines and powerful incisors for ripping and cutting meat, and flat molars for grinding up plant materials. By the way, scientists use the word dentition to refer to the arrangement of teeth in the mouth. Question 2. What is a platypus? Is there a link to a video or information online that you could share with us? The platypus is a carnivorous mammal found only in Australia. It looks like a bunch of animals mixed together—it has some physical features of a duck, and some physical features of a beaver. It has several mammal characteristics, like fur, but also lays eggs. Males are also venomous, which is kind of cool! Question 3. Do all mammals have tails? A lot of mammals have really obvious tails—just look at your dog or your cat for an example. Most mammals, if not all of them, have a tail at some point in their lives. Human beings, while still inside their mothers, have tails for about four weeks, but the tails disappear long before they are born. Ms Cassell can show you where your tailbone is; the tailbone is kind of like a reminder of where our tails once were. Question 4. How do mammals sleep? The whole idea of sleep is really fascinating to scientists. The short answer is that most mammals sleep pretty much like we do—they find a quiet, safe spot where they can be warm. They relax, and after awhile their bodies and brains “slow down” a bit for a period of time. Of course, their senses are still active so they will hear sounds and be able to recognize any dangers. And, like us, many animals dream too. Question 5. What part of the land do mammals live in? Mammals can be found in all sorts of habitats on land. We find them in deserts, wetlands, forests, tundra and grasslands. There are mammals pretty much everywhere on land. I don’t think I could name a place where you don’t find mammals. Of course, mammals live in the water too; don’t forget about whales and dolphins, seals and sea lions. Thank you so much for answering all of our questions. We are pretty sure you took a lot of your time to answer all of our questions. -That a lot of the time mammals sleep just like us! Thank you again for answering our questions! We will be in touch if we have any more questions for you.